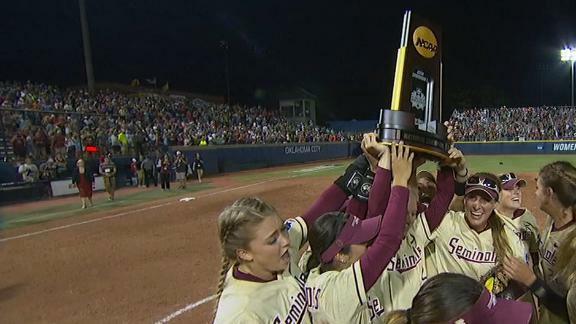 Florida State defeats Washington 8-3 and claims the school's first Women's College World Series championship. After recording 13 hits during the WCWS, FSU's Jessie Warren is named the Most Outstanding Player and discusses how happy she is for the Seminoles. 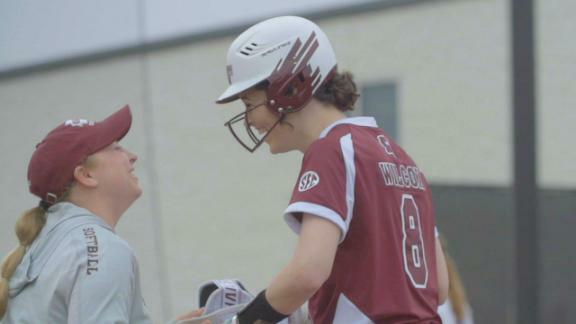 Florida State coach Lonni Alameda expresses how it feels to lead her softball team to their first ever Women's College World Series Championship. Jessie Warren extends the Seminoles' lead to 8-3 as she launches a homer to the bleachers in center field in the fourth inning. Elizabeth Mason sends a two-run homer to dead center as the Seminoles take a 7-3 commanding lead. 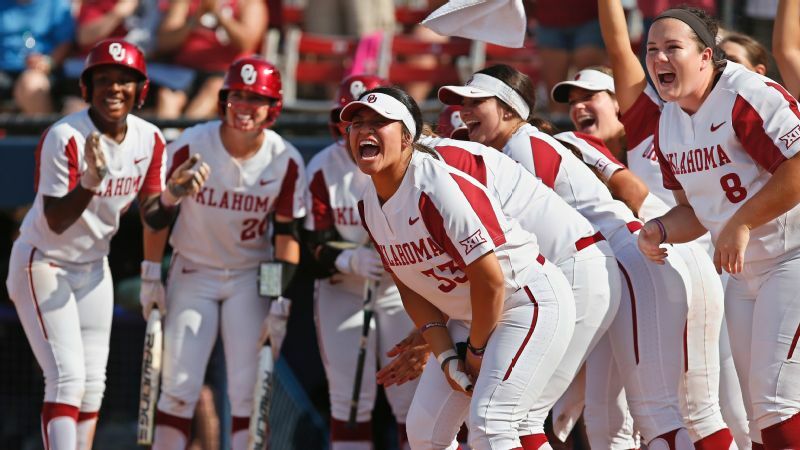 Jessica Mendoza says that Florida State and Washington are two "evenly matched" teams and sees the series going all the way. FSU's Jessie Warren lays out to catch a popup bunt and throws out Trysten Melhart at first for a double play. The game's first score comes from Anna Shelnutt's leadoff home run to center field in the sixth inning against Washington. Washington's Julia DePonte hits Washington's first home run of the Women's College World Series to give the Huskies a 3-0 lead over Oklahoma in the fifth inning. The Huskies' Taylor Van Zee drives in two runs in the fifth inning to give the Huskies a 3-0 lead over Pac-12 rival Oregon. Florida's Sophia Reynoso gives Florida a 2-0 lead over UCLA with a second-inning home run off Rachel Garcia. The Bruins' bats were going quietly into the night until Kylee Perez hit a three-run homer to put UCLA in front against Florida State. 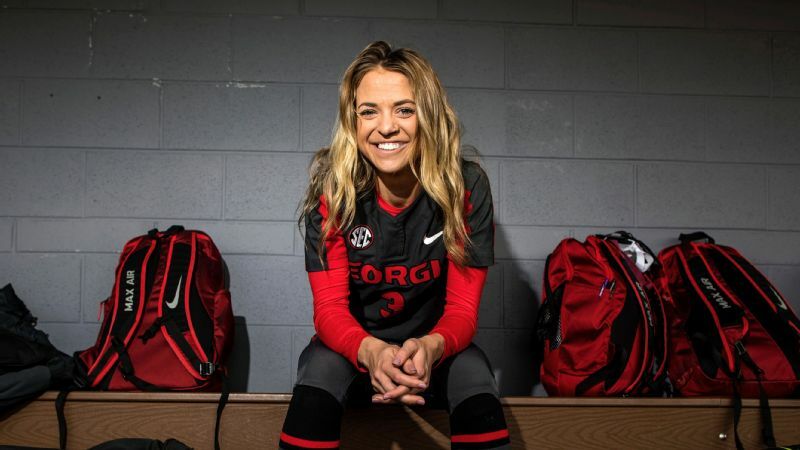 Georgia junior Alyssa DiCarlo discusses her stellar play this postseason and earning a close victory against Tennessee. The Aggies blow a 2-run lead in the bottom of the 7th inning thanks to two infield errors. Florida would come from behind for a 5-4 win. The Gators earn their sixth straight super regional berth behind a no-hitter from pitcher Aleshia Ocasio. Arkansas defeats Wichita State 6-4 to clinch a spot in the super regionals for the first time in school history. The Gamecocks fall to the Flames 3-1 but respond in walk-off fashion against the Pride with a 5-4 victory. Carsyn Gordon hits an inside-the-park home run to lift Florida State past Auburn 2-1 in the NCAA tournament. Jenny Schaper hits a grand slam off of the video scoreboard in the fifth inning to give Kentucky a 10-1 win over Illinois-Chicago. The Lady Vols record only four hits but make quick work against the Hawks in Game 1 of the NCAA tournament.